"Word of the year" is not something new. Actually, my mom was the first person to tell me about it, and she's been doing it for years... so obviously I give her all the credit;) I like the idea, but with the newness and unpredictability of motherhood, I wasn't going to force any of it... unless it came to me. In my last post, I hinted at how certain fears in motherhood have caused me to feel a little "locked up." And I think I had some similar fears about wifehood - that the bold young woman I was before marriage wouldn't quite fit into the image that I had of a "perfect wife." But over the last few months, I was beginning to feel the pressure in my soul, like a tea kettle about to scream. I wasn't unhappy. There was just... something. Inside of me. Pent up. Begging for me to let her out. Begging for me to cast out the fear and jump somewhere. And then here comes January, riding in like a shining new-year-knight on a white horse named "Start Fresh." Ever since then, it seems like I have been surrounded by dreamers. I'm not kidding you. From "random" relationships the Lord formed, Young Living rallies, sermons, podcasts, blog post articles... It seemed like the universe was screaming at me. Testimony after testimony have been constantly streaming into my ears. The Lord fulfills His promises. Not only that, but the Lord has great vision for our lives. My life. And when I can align myself with that vision - God's vision - taking closer steps to it every day, leaning into it, believing it, nothing is impossible. 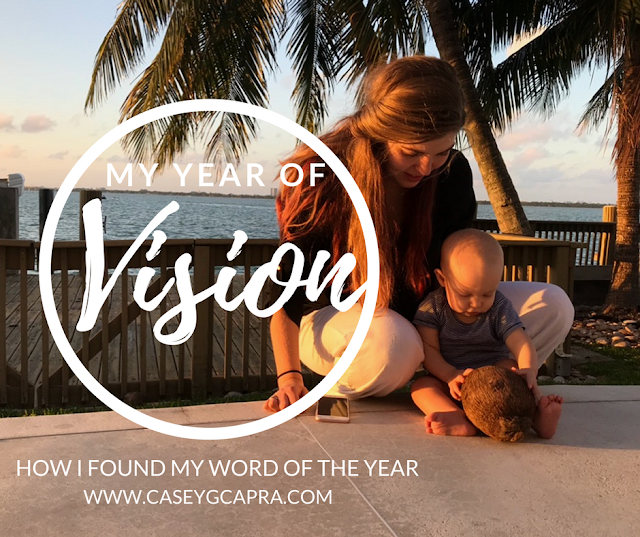 So when I say that my word of the year is "vision," I'm not just choosing random visions or 5-year goals to focus on. No, I want to know what the Lord's vision is for my life. then how the heck am I going to assume that the Lord doesn't have something big for me? So Vision is my word for the year. I want to see what He sees in my life. I want to be dreaming big because He is dreaming big. I want to be brave because He named me Brave. I want to live a victorious life because He didn't come to give me anything less. And what do those visions look like? I'm not completely sure yet. But I know they involve investing my "talents" and not "burying them." It involves sowing into what I'm passionate about even if there seems like there's no fruit (yet). It involves taking bold steps in scary directions. And we'll see what happens! I'm still learning how to have greater vision for my life. Do you have great vision for your life? How do you foster it? Are these truths hard for you to believe? That God has big plans for you and that He has formed days just for you?